Strengthening a weak chin with an injection of filler can help to create a stronger-looking jaw. This is a great substitute for surgery if you are unsure about the change and would like to see how it might look. Keep in mind that dermal fillers offer outstanding results for a mildly recessed chin. With over 25 years of experience injecting fillers Dr. Ricciardelli is keenly aware of what is crucial in achieving a natural looking chin. Dr. Ricciardelli has been named an Expert Injector by New Beauty Magazine. How do fillers work to create a stronger chin and jawline? Dr. Ricciardelli prefers to use Voluma or Radiesse in this area. The fillers are strategically injected into the area taking into consideration your facial structure and the degree of projection, shape and size. If you have a small or receded chin, a weak facial profile, or a soft tissue injury to the chin area you may be a good candidate for filler. At your consultation, Dr. Ricciardelli will examine your face, paying particular attention to facial structure and profile. Your goals and expectations will be discussed thoroughly. One to two weeks before your injection, Dr. Ricciardelli may recommend stopping aspirin, St. John’s Wort, high doses of vitamin E or blood thinners to minimize your risk of bruising. Feel free to bring a list of questions and picture. We love an informed patient. 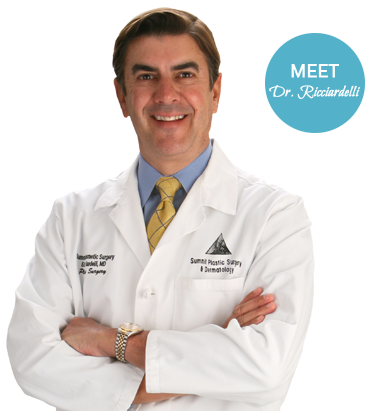 Dr. Ricciardelli will let you know what to expect before, during and after your procedure and answer all of your question. This procedure is quick and simple and is performed with a very an ultra-fine needle. A topical numbing cream can be used to numb the area, but in most cases is not needed. Expect to have a feeling of fullness in the area. You will be given an instruction sheet for your specific needs and small ice packets to apply after treatment. Arnica Montana can speed up the healing process and is available if you are someone who bruises easily. The result is immediate and may look a little swollen for a few days. Generally it takes about three days before you see changes and 2 weeks before the full effects can be seen. Expect the treatment to last 12-18 months in most cases. The filler will most likely dissipate over that time but not go away completely. Our door is always open for any questions.